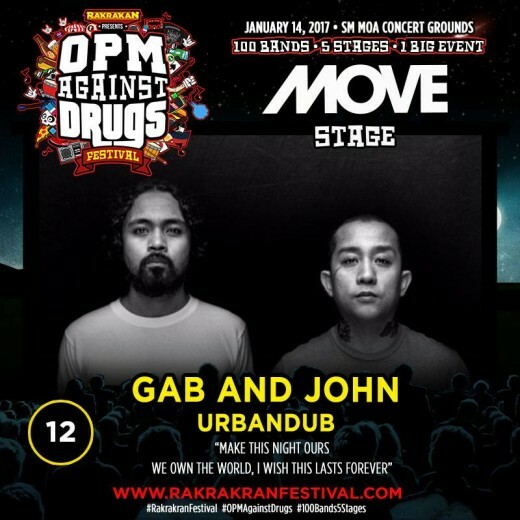 Rakrakan Festival: OPM Against Drugs could possibly be the largest music festival in the country to date. From last year’s line-up of 70 bands in 3 different stages, they’ve outdone themselves and increase the line-up to 100 bands at 5 different stages! Not only is it a music festival but there are also other things to look forward to in this big event such as a skateboarding exhibition and competition, street art contest, merch exhibit and other cool stuff. It’s easy to get lost in the sights and sounds at a big event like Rakrakan Festival. As we count down the days leading to the biggest event of 2017, we’ve decided to help by featuring some of the artists that would be performing at the 5 different stages at Rakrakan Festival. Rakrakan Festival has group different artists under one particular genre so that each stage would have it’s own unique sound that would cater to its specific audience. The first stage that we’ll be featuring would be the MOVE Stage. If you’re into mainstream, pop/rock music then you’ll love the artists who’ll performing at the MOVE stage. Here are some of the artists who’ll be performing at the MOVE stage. Sponge Cola is Yael (vocals), Armo (guitar), Gosh (bass) and Ted (drums). The band has been around in the local music scene and has released a number of albums and produced hits such as Bitiw, Di Na Mababawi, Gemini, Kay Tagal Kitang Hinintay and Jeepney to name a few. 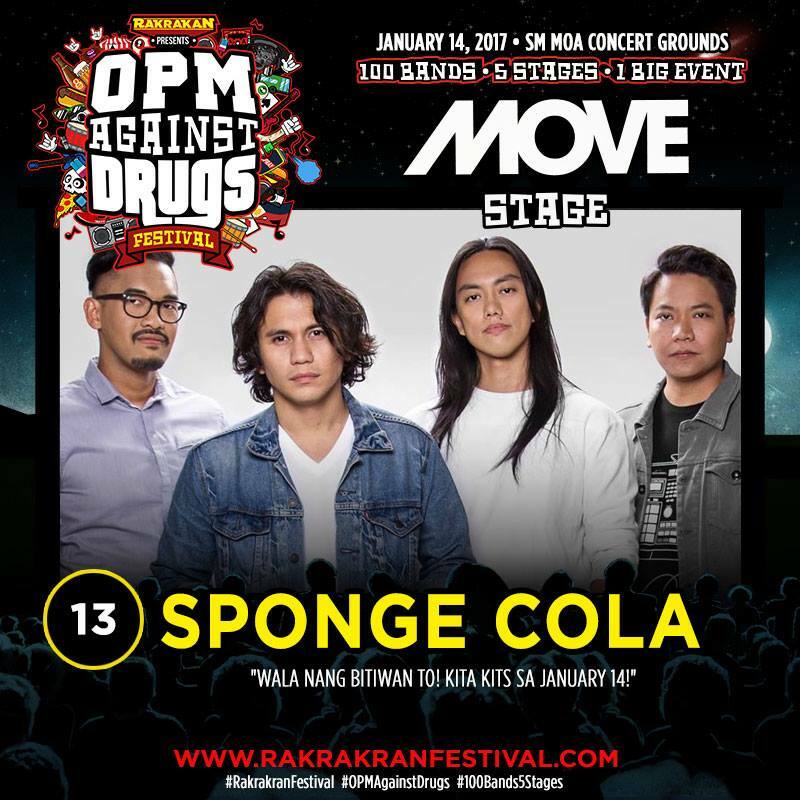 Fans of the band should be delighted to hear new and old tracks when Sponge Cola hits the Move Stage. Barbie Almalbis has been around in the local music for as long as I can remember and she doesn’t seem to age one bit. She’s as ageless as her music even from her days at Hungry Young Poets, Barbie’s Cradle until she became a solo act as Barbie Almalbis. 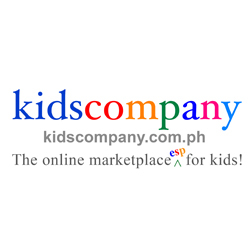 Barbie has produced the well loved anthems Torpe, Firewoman, Tabing Ilong, Limang Dipang Tao and Just A Smile. Barbie has also recently performed at a sold out concert along with other top female acts Aia De Leon and Kitchie Nadal. 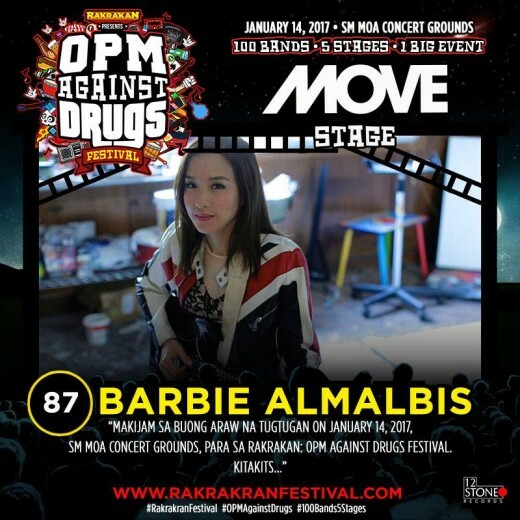 Be sure to visit the MOVE stage at Rakrakan Festival and let the music of Barbie Almalbis captivate you. 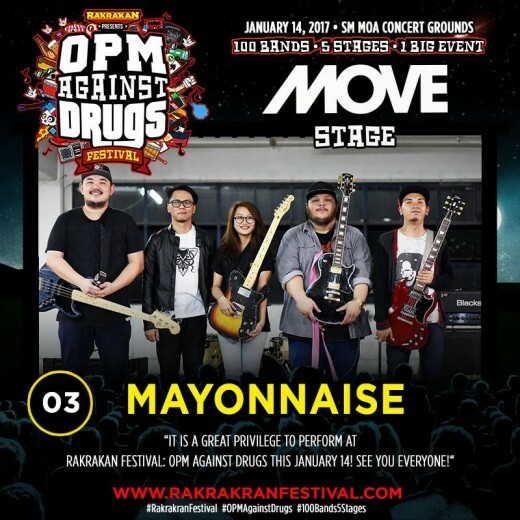 Mayonnaise has gone a long way since they bagged the grand prize of the battle of bands for more than a decade ago. The band has released numerous albums and well-loved anthems over the years. Mayonnaise also had a number of member changes but their current line-up consists of Monty Macalino (Vocals;Guitars), Shan Regalado (Drums), Carlo Servano (Lead Guitars), Nikki Tirona (bass/vocals), Maan Furio (Vocals/Rhythm Guitars). 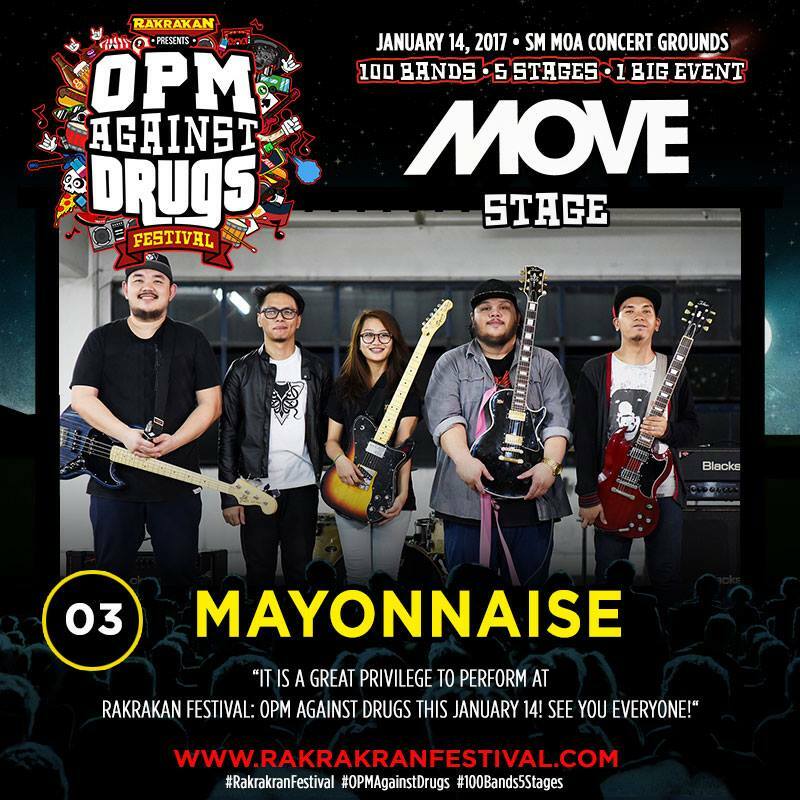 Watch Mayonnaise perform their hits such as Bakit Pt 2, Jopay, Sinungaling, Dahil Ikaw, Tayo Na Lang Dalawa and tracks from their recently released album For The Rest Of My Life at the Move Stage in Rakrakan Festival. 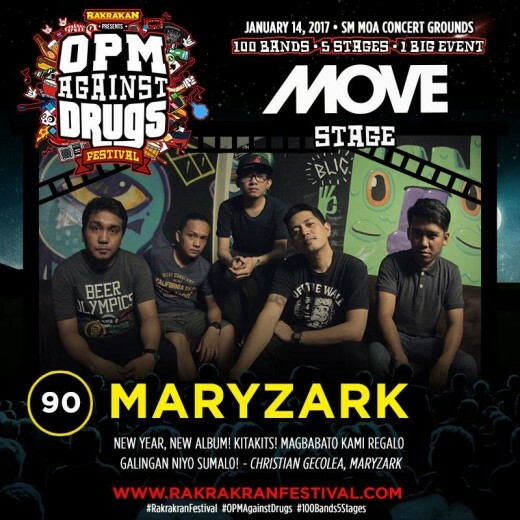 Maryzark is among the veteran acts of Rakrakan Festival. Maryzark has performed at a number of Rakista events and has gained a solid number of following over the years. The band also recently celebrated the 10th year anniversary of their first album, Good Mournings. Maryzark will also be releasing a brand new album this coming 2017. Be sure to catch Maryzark at the MOVE Stage as they perform their hits 4-2, M3, Kismet, Suko, Huli and Kai. Fans of local favorite and well-loved band, URBANDUB should be delighted to know that Gabby Alipe and John Dinopol would be singing our favorite tunes at Rakrakan Festival as Gab and John. If you ever need a reason why you should watch the Move Stage, let this be it. Be sure to sing-along to acoustic version of your favorite tracks like A New Tattoo, First of Summer, Soul Searching, Evidence and The Fight is Over. 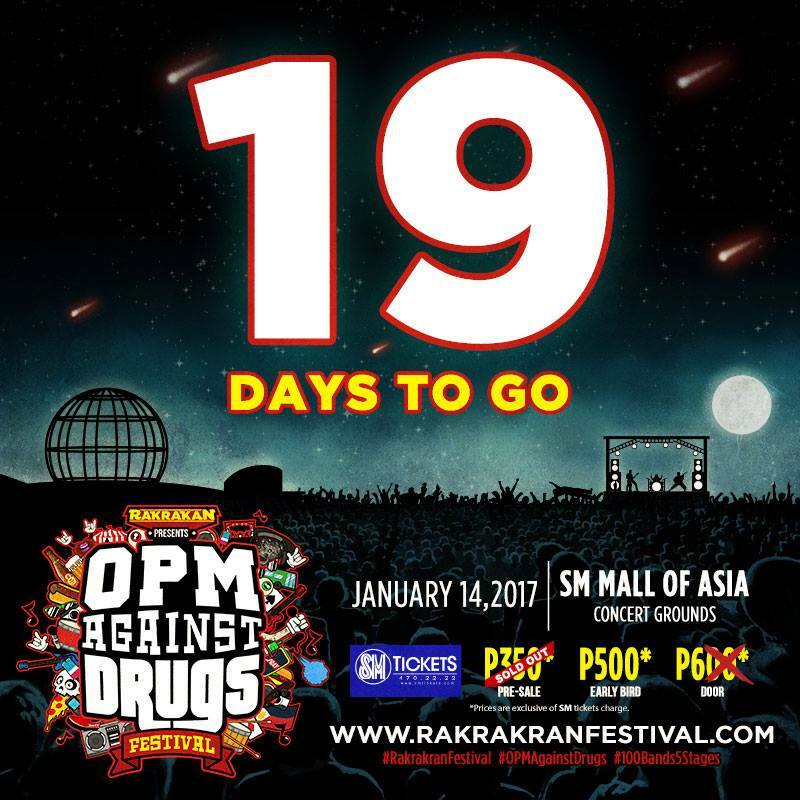 We’re only 19 days away from Rakrakan Festival: OPM Against Drugs Festival. Be sure to secure your tickets at SM Tickets outlets in all SM Cinemas nationwide. Avail of the early bird tickets NOW!